HPC Blog Yet another record has fallen at the Asia Supercomputer Community Student Cluster Competition. This time, it’s the HPCG (High Performance Conjugate Gradients) mark. Little-known Weifang University in Shandong Province, which also set a new student LINPACK record, notched a score of 992.333 GFLOP/s, handily topping the rest of the field. 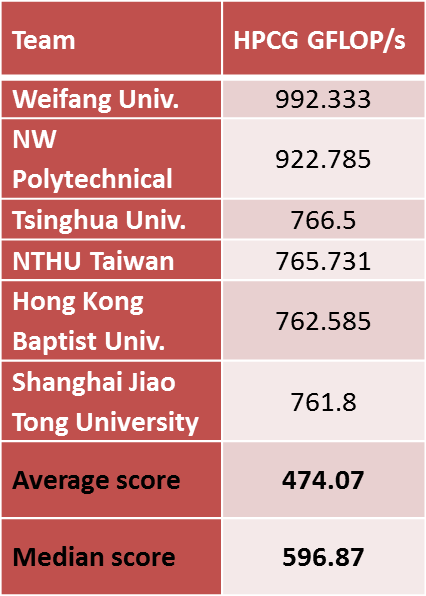 Only China’s Northwestern Polytechnical University came close to Weifant’s score, with the whiz kids from traditional student clustering powers Tsinghua and NTHU farther back in the pack. Semi-newcomer Hong Kong Baptist and veteran team Shanghai Jiao Tong grab honorable mention status due to their scores being so far above average. As if being a much better simulation of real-world HPC workloads isn’t enough, HPCG is also much quicker to run – coming in at only 30 minutes. What’s not to like?